My worst fears have come to pass and for a while I thought the LEO-1 was not going to make it. I had made a test board to act as a fake control board so that I could test the memory board. I had tested it with the Real Time Clock chip and everything was working great. So I carried on building the memory board and connected up the two ZIF sockets. I burned some test data to one of the EEPROMs and put it in one of the sockets, connected up a couple of digits to one half the data bus and used the test board to address the ROM. Lo and behold, the digits showed the correct data coming out of the ROM. It was working as expected. Here’s a picture of the set-up. The digits on the protoboard are showing 3 4 which is the first byte in the ROM. I switched various addresses and watched the data come out and everything seemed fine, when suddenly the digits went all weird, like a square 8 which is an impossible display. It was pretty clear that the display was oscillating between two values at such a high speed that it looked like all the dots were on at the same time. And so began several weeks of pure hell trying to figure out what was going on and what caused it. I was able to reliably repeat the problem by setting a certain address and then changing to the next address so that the data changed from 0 0 to 0 1. Often, but not always, the thing would start oscillating. I put my scope on it and found an 8Mhz oscillation on the data bus. I suspected the ROM was faulty but all the ROMs had the same behaviour. I suspected the test board because I had forgotten to buffer the address bus lines. That was a dumb mistake which I decided to fix, so I spent a week adding 74244 buffers to the test board. That didn’t fix the problem. Then I realised I had forgotten to buffer the control signals too, so I used a few spare gates on the board’s 7400 to do that. Didn’t fix it. Weeks had gone by and this random oscillation was still happening. I remembered that you can get this kind of problem if you forget to connect an unused input on a gate, so I checked the schematics and scoured the board for disconnected pins. No luck. Everything was as it should be. One night in early December as I sat there with my head in my hands, I realised that if I couldn’t solve this, there would be no chance of the LEO-1 working at all. My fairly trivial memory board wasn’t even stable at manual switching speeds! I thought about giving up — all that time, effort and money down the drain. By the time I went to bed, I was pretty depressed. The next day I took one last crack at solving the problem. I had been studying all the data signals on my scope’s logic analyzer and had not had any ideas beyond unconnected pins and faulty chips. You can see in the picture above that the test board’s ribbon cable was sticking up in the air. It was like that because I was using a short cable for the address bus and the long data bus cable had to be bent in order to be plugged in. Well, for some reason, while the oscillation problem was happening, I just happened to push the cable a bit flatter — and the oscillation stopped. That didn’t seem like a coincidence, so I tried changing the address with the cable flat — no oscillation. I bent the cable again and then next time I switched addresses, the oscillation started again. I could control whether the oscillation would happen or not by bending and straightening the cable. What’s more, the scope showed that the oscillation frequency was changing between about 7 and 8 MHz depending on how the cable was folded. Then it hit me. Was the ribbon cable suffering from transmission line problems? Those problems that I had been obsessing over right back at the start? Things like reflections and ringing and all that annoying stuff? And did folding the cable do something random like perhaps change the impedance or cause cross-talk? And could that make the bus transceiver chip go into some kind of oscillation? Well, I was not sure and I’m still not sure now, but I have a theory. When reading data out of the ROM, the test-board end of the 12″ cable was not connected to anything. That meant that when the data bus switched from 00 to 01, that 1 bit went down to the other end of the 12″ and reflected back. Ordinarily I would have expected the reflection to die out pretty quickly and just cause a bit of ringing. But something about the folded cable caused it to keep bouncing, perhaps amplified by the bus driver itself. After reading up a bit about line termination, I did an experiment. 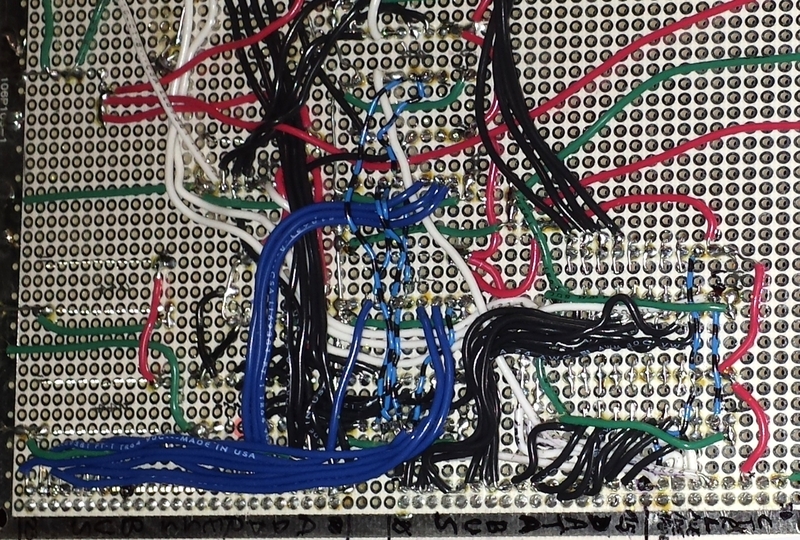 I added a bunch of 82 ohm resistors at the memory board end of the cable, just before the 74245 transceiver. After that, I couldn’t repeat the problem any more. No amount of switching addresses or folding the cable in any way caused the oscillation and I haven’t seen the problem since. I don’t really understand why it works except that possibly the resistors absorb the reflection and damp it so that it doesn’t turn into an oscillation, but I still don’t understand why I got full permanent oscillation in the first place. I’d love to hear from any experts out there who can explain what the heck was going on. As if that wasn’t enough trouble, the next thing that went wrong was that I discovered that I had not left nearly enough room between the address bus header and the first bunch of chips. There was no room left to solder any more wires and I still had a couple of busses to connect there. I found I had no option but to move the address bus header to the other side of the board. I had to disconnect all the wires, desolder the header, re-solder it and redo all the work of connecting the 24 address lines to the ZIF sockets. While I was at it, I bit the bullet and removed the majority of the thick annoying wires and replaced them all with magnet wire. I learned a valuable lesson there. 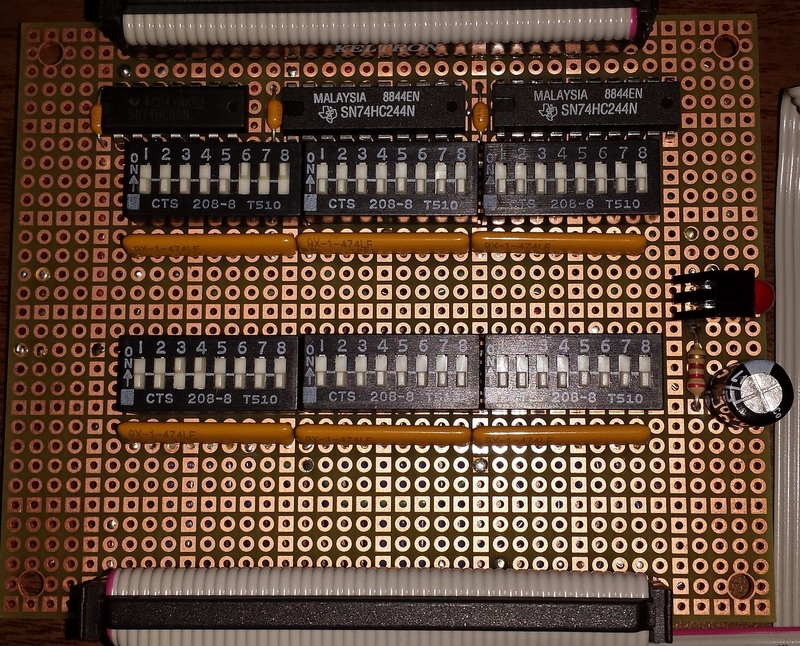 You have to leave plenty of room between headers and the chips they connect to so that there’s room to solder multiple busses to the same header pins. From now on, I’m only going to use regular wire for power connections. Everything else will be done with thin magnet wire. So, the LEO-1 lives on after all and right now I’m in the process of wiring up the main RAM and ROM sockets. After that it’s the I/O chips and then board number 1 of 4 is complete. Well, I have started construction of this monster… and a monster it indeed is. I am reminded of the joke in The Hitchhiker’s Guide to the Galaxy about the terrible error in scale which caused an entire battle-fleet to be eaten by a small dog. I have made such an error myself, a huge error in scale on several levels. First of all, I made a bit of a mistake with the scale of the whole project. This project is colossal. I started to get a sense of this while I was drawing the schematics, but I really had no idea until I noticed it was taking me a couple of minutes to solder a single wire and then decided to estimate how many wires I was going to need. Well, although I haven’t finished numbering the chips on the schematics, I think there’s going to be around 200 chips. Average number of pins per chip… about 18. So that makes about 3600 solder joints just for the chip pins and there are many other things to consider besides those. Working at one joint every 3 minutes for 4 hours a day, that will take about 45 days just for the soldering. Not to mention all the other things that need doing. In reality, I can at least double that, so about 3 months soldering time. Some time next May I think I will laugh at that estimate. I had originally decided to use PCBs since that would be the easiest way to build it. Simply solder the parts onto the board and you’re done. No need for masses and masses of individual wire connections. I did a test for one register and it came to over $100 for a small 5″ board. Even using a cheap Chinese PCB house, the large boards I need would probably cost an absolute fortune which is why I went with prototyping boards. I just couldn’t justify spending that kind of money on the boards alone. So, I’m now locked into using prototyping boards and the second error I made was how much space this stuff takes up. I had done a number of layout tests and was able to pack a lot of chips into a small space. My boards are 10.6″ square and I can sensibly fit about 80 or 90 chips on a board (or non-sensibly, about 150). But even being sensible about it, I’m finding I’m needing a lot more space between the chips than I have allowed for, due to the thickness of the wires and the fact that a lot of signals are bussed and therefore need 16 wires. The 24 AWG wire I’m using has quite thick insulation which means you can only fit about 12 wires side-by-side in an inch. With my planned distance of only about ½ an inch between the chips, there simply isn’t enough room. I started construction on the memory board since that is the simplest of the four main boards. This board has some trivial address decoding, a real time clock, I/O ports, DIP switches and some rows of RAM and ROM chips. By starting with this, I figured I could get something testable pretty quickly. In reality, it took 2½ weeks before I was able to test anything at all. To test one board without relying on another board, one needs a method of testing. I decided to build a ‘throw-away’ test board (which turned out quite nice so I won’t be throwing it away). This board is basically a fake control board to fool the memory board into thinking it’s being controlled by a CPU. This board has 6 DIP switches on it (24 for the address bus, 16 for the data bus and 8 for other control signals). It also has a few bus drivers and so on to make sure I can get it off the data bus when it’s telling a memory unit to be on the data bus. It took me a couple of weeks to get the parts and build this board. This was the first inkling I had that I had underestimated the scale of the project and the scale of the required space. Here’s a picture of the finished test board. It looks quite tidy until you turn it over. Clearly the wires are taking up far too much space and I confirmed that when I started soldering the memory board itself. There is simply no way with my planned layout that I will be able to fit all the wires in such that I can actually still get to the board to solder it. I’ve already run into problems with wires getting in the way of chip pins and I haven’t even started on anything that uses the whole data bus. Looking around online for how other people do this kind of thing, the solution seems to be to use thinner wire. I have ordered a couple of reels of ‘magnet’ wire, the kind that is used for making coils in motors and power supplies. This wire is very thin (mine will be 28 and 32 AWG) and you can solder through the insulation which burns away. I’m planning to switch to this wire for all the busses and possibly more. I’ll continue to use my current thicker wire for power and ground lines and for other odd connections here and there. 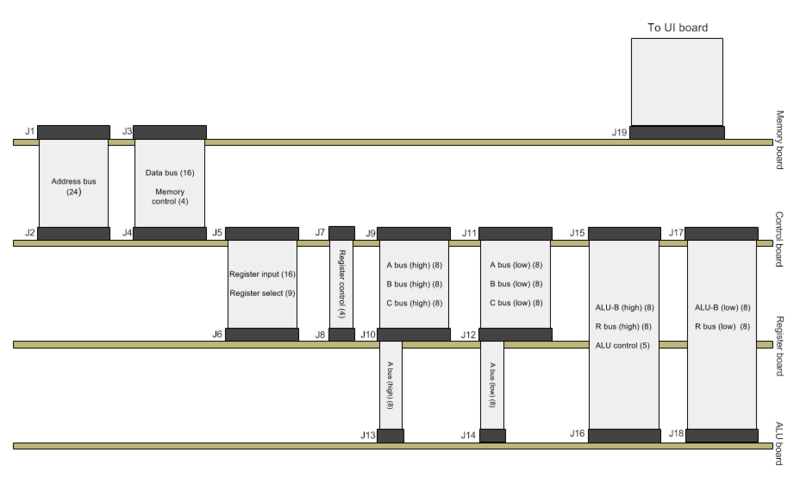 In other news, I have finished drawing all the schematics including the ALU. It was a bit tricky, especially the shifter section. It’s pretty easy to make a shifter that shifts by a single bit, but my design calls for the ability to shift by 1 to 8 bits instantly. 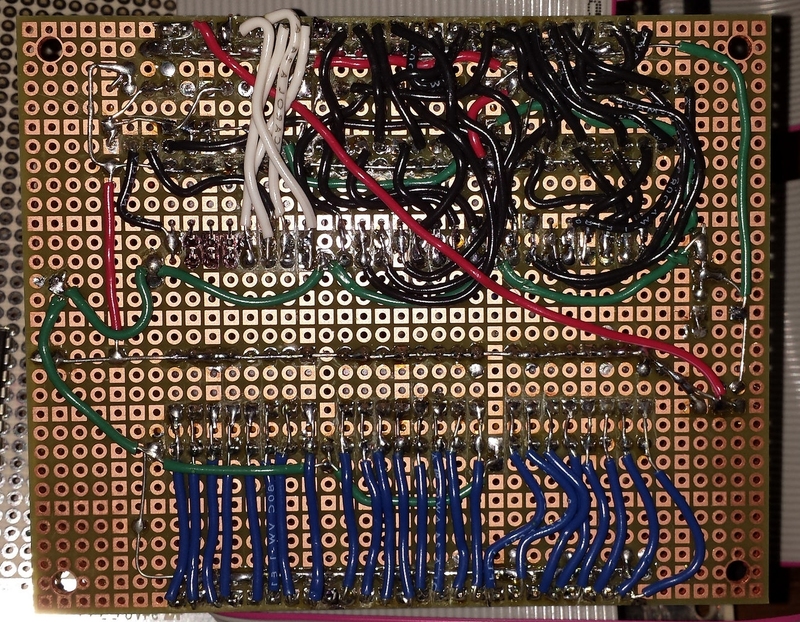 I used a 1-of-8 selector (mux) to choose the signals based on the shift amount and then had to wrap my head around how to choose the single-bit signals to route to each of the eight inputs on each of the 16 chips. I suddenly realized that it should be possible to make a generalized shifter that shifts one way and then re-use it to shift the other way by rearranging the signals as they go in and out of it. 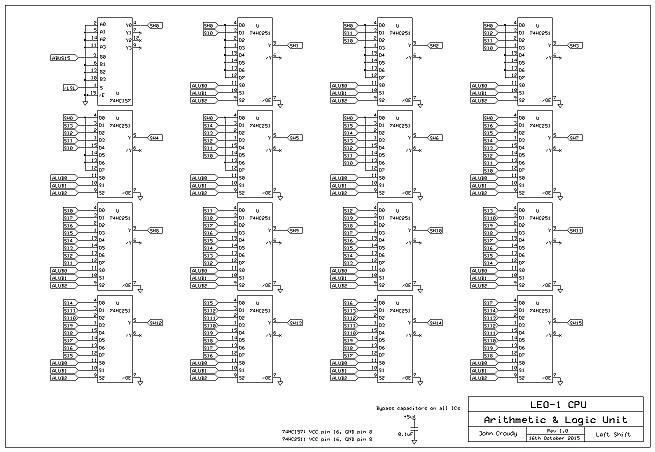 A few hours and a lot of brain twisting later, I had drawn the schematic and found that I had saved myself ten chips. That doesn’t save any money because I had already bought the chips in bulk, but it saves on a couple of hundred solder joints that I won’t have to do. I verified this optimization by knocking it up in Logisim and found that it does indeed work. I went to bed that night feeling ever so clever, like I had invented something. But later I found, as I usually do, that this technique is pretty much standard for shifters and I had simply reinvented the wheel. Finally, I had a very hard time deciding how to connect the four main boards together. The connections require rather a lot of wires. I had already decided to use ribbon cables because I had found a supplier that would make the cables to my requested size at a very reasonable cost. But the layout had me stumped for weeks, I just couldn’t seem to nail it down. Eventually, with the help of Google Drawings, I made the final plan. As you can see, this is going to need a lot of soldering and a lot of wiring. I can do this. There is no ‘try’. When is a ground not a ground?